Our Zip Dee awning—the one all Airstreams have been fitted with since the Earth’s crust was cooling—was trouble from the start. For reasons that were later revealed, our first attempt to operate it went badly, and subsequent attempts got progressively worse. Ladies and gentlemen, here’s the video containing the official, definitive answer you’ve been seeking: “How to Deploy Your Airstream Awning”. If you’re not in a hurry to get to Point B, avoid the mega freeways. That’s the best way to spy a sign that reads “Welcome to [Podunk]: Home of [Vague Celebrity]”. Many “home of” towns have legitimate claims to fame, like Winterset, Iowa and Millville, Indiana. Other towns are so sweet to champion their minor native sons. Well, then, if you like blowing things up you’ll positively salivate at the Ordnance Museum in the all things military town of Hawthorne, Nevada. Love the allure of Airstreams but don’t have one yourself? Well, what’s the matter with you. Get one. Join us. Resistance is futile. Want to spend the night in one first? No problem. That’s a thing. There are several “Airstream hotel” options out West. Not only does this item not fold or collapse, many would argue that it isn’t a space saver either. But it was too cute to pass up. The Elite 3 in 1 Mini Breakfast Shoppe does triple duty as three appliances rolled into one. “Here” is a little pink shed at the end of a gravel driveway out behind her house on a residential side street. 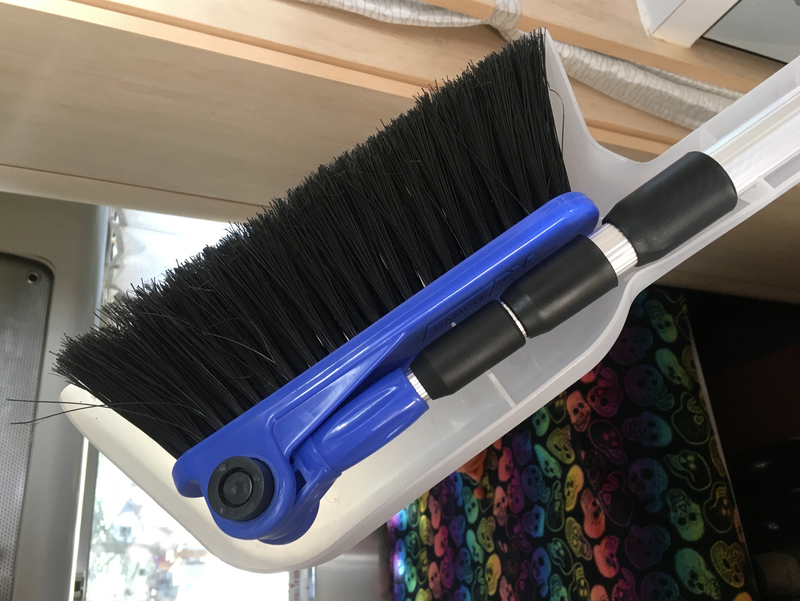 I don’t know why I thought I needed the Camco adjustable broom, as I had a very serviceable little mini angle broom that fit perfectly well in the tall wardrobe storage area of the DWR. But I couldn’t resist another foldable gadget. I tried it and I like it…I guess.